Male fruit flies have one X chromosome per cell, females have two. So genes on the male X must work twice as hard to produce the same amount of protein as its female counterparts. An LMU team has found a new switch involved in making this possible. Genes on the single X chromosome in males (green) are twice as active as those on each of the two X chromosomes in females. 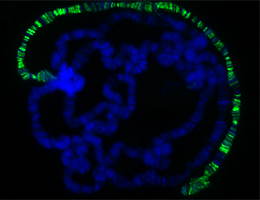 The immunofluorescence image shows giant polytene chromosomes from the salivary glands of a male Drosophila larva, stained to reveal chromosomal DNA (blue) and a protein component of the dosage compensation complex on the X chromosome (green). In the fruit fly Drosophila – as in humans – the sexes have different sets of chromosomes. While females have two X chromosomes in their somatic cells, males have one X and one copy of the much smaller Y. The latter determines maleness but carries very few genes, while the X chromosome has thousands of genes. Many of these encode essential proteins that must be made in equal amounts in both sexes, and males that fail to meet this requirement are inviable. The males make up for the difference in X chromosome copy number by ensuring that each gene on their X chromosome is expressed at twice the rate of its equivalent on a female X, a phenomenon known as dosage compensation. The so-called Dosage Compensation Complex (DCC) is responsible for distinguishing the X chromosome from the others in males and doubling the level of activity of most of the genes it contains. The DCC is a complicated molecular machine which, in addition to so-called MSL proteins, contains two long RNA molecules (referred to as roX RNAs). “Correct incorporation of roX RNAs is known to be essential for DCC function, but how this is accomplished has been unclear,” says LMU biologist Professor Peter Becker, who studies how the operation of the DCC is regulated. Members of his team have now discovered that a change in the structural conformation of the roX RNAs is a prerequisite for the functional activation of DCC. These RNAs all contain a characteristic hairpin structure, which is conserved in various fly species. “We have long supposed that such a widely conserved structure must be of functional significance, but we were unable to demonstrate a specific binding interaction between the hairpin and the MSL protein components of the DCC”, Becker explains. The reason for this is revealed in the new study. It turns out that the hairpin structure actually prevents protein binding. The hairpin must first be unwound by a specific enzyme before the MSL proteins can bind to the RNAs and a functional DCC is formed. The closed hairpin conformation is equivalent to a switch fixed in the OFF position. Unwinding of the hairpin flips the switch to ON, thus permitting assembly of the active DCC. “We believe that this switch is only activated under conditions that are found at certain sites on the X chromosome. This would ensure that dosage compensation is restricted to genes on the X”, says Becker. The study was supported by grants from the DFG to the Collaborative Research Center Transregio 5, and by an EU-funded ERC Advanced Grant for the project “Assembly and maintenance of a co-regulated chromosomal compartment” (ACCOMPLI).